The Cresswell Plot – And you thought your family was horrifying! 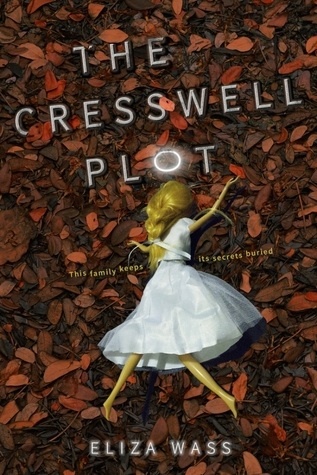 So, there are books about cults, and then there is this – The Cresswell Plot. Homegrown religion courtesy of a clearly unbalanced and abusive father. It is weird and disturbing in ways you probably can’t imagine. I gave it four stars on entertainment value, but many critics thought three stars were generous. I think it’s about expectations – if you are reading this for some meaningful thoughts about . . . Well . . . anything, you are going to be disappointed. However, if you just want to rubberneck some strange – this is your book. The woods were insane in the dark, terrifying and magical at the same time. But best of all were the stars, which trumpeted their light into the misty dark. Castella Cresswell and her five siblings—Hannan, Caspar, Mortimer, Delvive, and Jerusalem—know what it’s like to be different. For years, their world has been confined to their ramshackle family home deep in the woods of upstate New York. They abide by the strict rule of God, whose messages come directly from their father. Slowly, Castley and her siblings start to test the boundaries of the laws that bind them. But, at school, they’re still the freaks they’ve always been to the outside world. Marked by their plain clothing. Unexplained bruising. Utter isolation from their classmates. That is, until Castley is forced to partner with the totally irritating, totally normal George Gray, who offers her a glimpse of a life filled with freedom and choice. Castley’s world rapidly expands beyond the woods she knows so well and the beliefs she once thought were the only truths. There is a future waiting for her if she can escape her father’s grasp, but Castley refuses to leave her siblings behind. Just as she begins to form a plan, her father makes a chilling announcement: the Cresswells will soon return to their home in heaven. With time running out on all of their lives, Castley must expose the depth of her father’s lies. The forest has buried the truth in darkness for far too long. Castley might be their last hope for salvation. I’m going to be straight – this book is full of crazy. I couldn’t tell who was buying into the religious indoctrination and who was just playing along and biding their time. That made it really hard to predict what was going to happen next. I read this in horrified fascination just like I would read about any extreme, real life horror story, and I think most readers will find themselves just as entranced. It was a bit of a guilty pleasure because the book focuses on giving readers the most sensationalized picture of religious extremism spurred by mental illness possible. There are no answers or even real nods to the fact that the father clearly has had a break with reality, though the fear that permeates a house ruled by an unstable and unpredictable mind rings true. What it boils down to is that the book plays on people’s fears and expectations, but does little to advance their understanding or compassion towards those who suffer from mental illness. Personally, I think that is okay, but if you are looking for more depth or message, it just isn’t here. It is strange and engaging and suspenseful, and most readers will be pretty fascinated by Castley’s living Hell. I’m adding it to my high school classroom library wish list, and I will recommend it to fans of psychological horror. Language and situations are appropriate for grades 9+. This is one of the strangest books I’ve encountered in YA. It was full on weird, and, yet . . . I still read it in a single sitting. Maybe the breathtaking cover mesmerized me. Maybe I just can’t resist a weird twist. Whatever it was, I was compelled to read on. Ultimately, it was a three star read for me, but I can’t say I don’t remember it months later. On the heels of the assault, Kenna is exiled to a nearby commune, known as Eclipse, to live with a relative she never knew she had. There, she discovers an extraordinary new way of life as she learns who she really is, and the wonders she’s capable of. For the first time, she starts to feel like she belongs somewhere. That her terrible secret makes her beautiful and strong, not dangerous. But the longer she stays at Eclipse, the more she senses there is something malignant lurking underneath it all. And she begins to suspect that her new family has sinister plans for her… . Kenna is an engaging protagonist with complex feelings and the little bit of a dark side needed to make her feel like a real person more than a character. The first person point of view gives readers plenty of insight into her inner workings, but it does leave the secondary characters feeling a little flat. I don’t think that is necessarily a negative thing because it does leave readers guessing about everyone’s intentions and it plays into the ominous atmosphere. The story is well paced to hold reader interest and develop Kenna’s internal conflicts. It does seem move quickly when it comes to external conflict, especially at the end when it starts to slam readers with action. I don’t think it will bother many readers because most of them will be left puzzling out the rather bizarre explanation behind Kenna’s abilities. It was certainly unique. This is one of those books that drags out the mystery until the last possible moment. Readers are given clues that allow them to make some inferences, but, ultimately there is a lot of delay and “we can’t tell you anything too revealing just yet” going on. I thought the book was definitely something I hadn’t seen before, but ultimately readers will be able to guess what it all comes down to because, well, cult. I enjoyed the story and found it engaging. It was creepy but not necessarily scary. There was suspense galore, and I really wasn’t sure how the story would pan out – I just knew it wouldn’t be bland. Language and situations are appropriate for high school readers (light sensuality, drug-like abuse of substances, and violence). 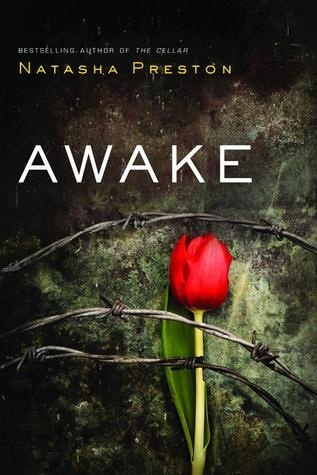 Lots of people really enjoyed Natasha Preston’s The Cellar and are looking forward to her new book, Awake. 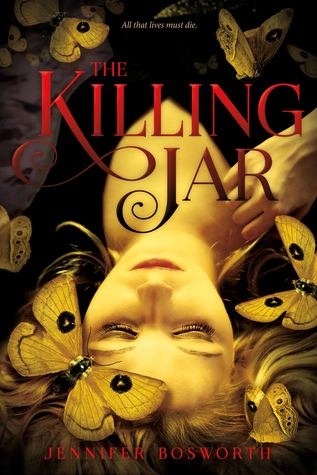 Unfortunately, this was definitely a two star book, and I don’t think it is worth your time (seriously -2.9 average on Goodreads). And they want her back. Awake had an interesting premise, and the dual narrators created a lot of dramatic irony. I’ve read several books dealing with similar topics this year, but none of them used this rather intriguing angle. The narrative is almost entirely dialogue and stage direction, though, so beyond the main internal conflict of each narrator, there is little dimension to the characters. This means that they don’t always come across as real people so much as actors in a play, especially the secondary characters who either represent good and evil with no gray areas. I think the plot is engaging enough that most readers will push past that flaw just to see how this one will end. I certainly had a good idea of what was going to happen, as will most readers, but the fun was in figuring out how it was going to happen. Unfortunately, I was most distressed by the final resolution to the story. I felt sick when I realized what decision Scarlett was ultimately going to make, especially considering all the growth she displayed as a character in the final third of the book. I was baffled and more horrified by the (probably) unintentional message it sent than by any of the intended horror in the book. If the target audience for a work is the YA crowd, I think it is important to consider what they are going to get out of it, and I just felt like this was setting impressionable readers up to excuse reprehensible behaviors in the name of true love. I wanted to like this book, but in the end, I just can’t forgive that ending. Why isn’t there more buzz about this book? Everyone should be talking about this book, if only for the premise I couldn’t quite believe – Minnow’s hands are removed by her cult. Say What? Surely it is metaphorical, right. Uh, no. Girl gets her hands cut off by the cult leader as punishment. Crazy. And crazy good. 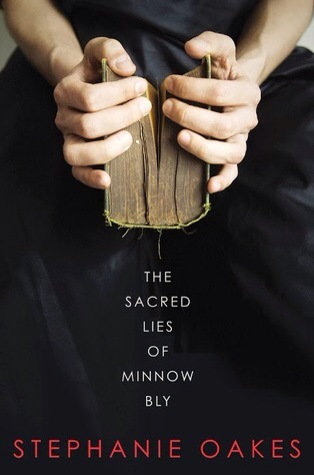 Minnow is an intriguing character, and I thoroughly enjoyed her journey. I’ve read several cult books this year (did you know that was a thing -YA books about coming of age in a cult?) and several fairy tale retellings (I had no idea Grimm could be this grim). This was by far the best, and if you like a haunting and beautiful, if disturbing, Bildungsroman, you will have to search long and hard to find one that surpasses this strange little gem. With a harrowing poetic voice, this contemporary page-turner is perfect for fans of Laurie Halse Anderson’s Speak, Julie Berry’s All The Truth That’s in Me, and the works of Ellen Hopkins. Whenever I come across a book that is such a mix of dark and bright, I’m always intrigued, but I found this book and it’s haunting prose particularly impressive for its ability to surprise me at almost every turn. I didn’t know anything about these characters or the plot, but I managed to make assumptions about everything, all of which the author carefully and thoughtfully disproves time and again. Of course the plot is compelling because Minnow is the only one with all the answers, and she is holding her cards close right up until the end. The author’s true craft, though, is in the narrative, which seamlessly slips between the past and present, building suspense and giving a true reckoning of a girl that isn’t as weak and naive as circumstances would have you initially believe. Minnow is a character who would be so easy to pity, but she is so much more than the things that have been done to her, and the author succeeded in drawing her as a complex character that lives and breathes beyond the page. Readers will be horrified as details become clearer, but they won’t doubt for a moment that Minnow is going to survive. I particularly enjoyed the friendship that formed between her and her hardened teen cell mate. Their sisterhood is a nice parallel to the twisted sisterhood that failed to protect Minnow when she needed it most. Themes of friendship, forgiveness, revenge and love add real depth to the story, but the biggest message is finding your own truth in a world where others will use their idea of truth to enslave you. I had never read the Grimm’s fairytale that inspired this book, but when I did, I was pretty awestruck by the brilliance of this reimagining. I think my high school students will enjoy this book, especially those who enjoyed Julie Berry’s All The Truth That’s in Me and it’s enigmatically silent and haunted narrator. Adults, too, will find this book hard to put down. Situations and language make this a book best suited for mature high school readers. I received an ARC through the Penguin First To Read program in exchange for an honest review.